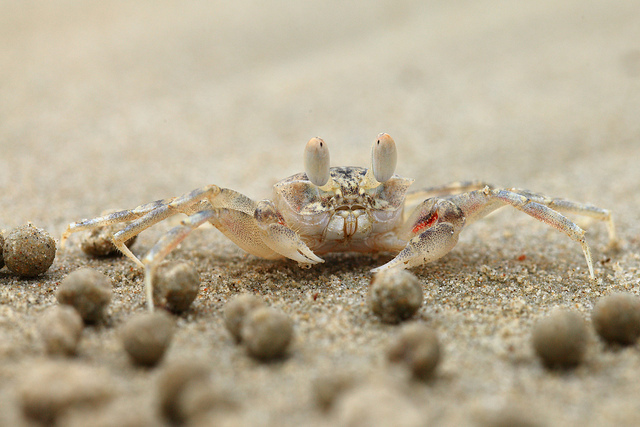 Small hermit and soldier crabs in Malaysia and Australia build their home digging a deep hope in the sand on a beach. They got a good idea of how to move sand up during his construction. Down in the hole this crab is making sand balls and later push them up to the surface, 2-3 balls at a time. 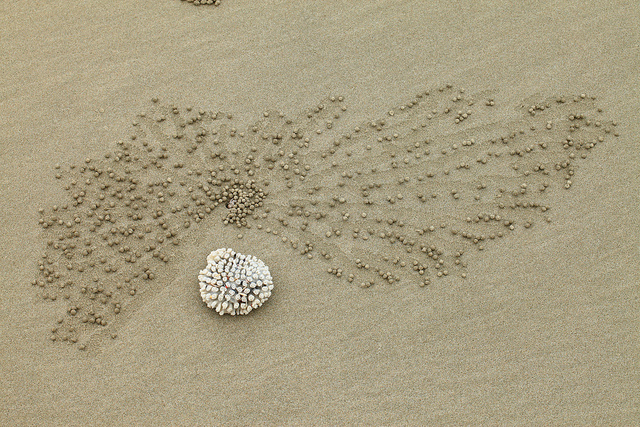 Pushing sand ball more far from the hole they form a kind of sand ball flower or sand ball galaxy. 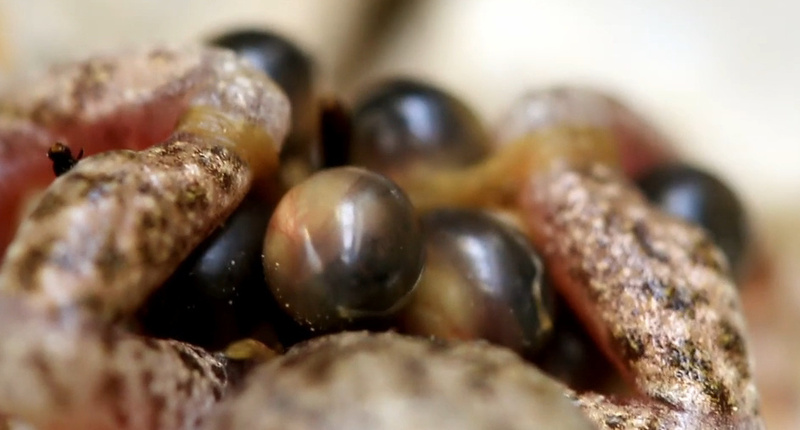 Up close you can see the almost perfectly spherical balls that the crabs engineer. They are meticulous in their method to say the very least. 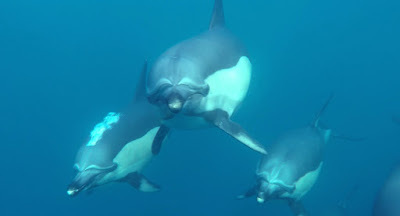 A huge pod of Common Dolphins (Delphinus delphis) makes its way up the East African Coast each year in the search of Sardines. Follow them for a short part of this journey to see what they find in this wonderful short by Simon Buxton. It was filmed off the Wild Coast Region - an unforgiving area with big seas and cold water. Thank goodness sardines come in cans for us! Thought extinct thousands of years ago, the Mallorcan midwife toad was discovered alive and well in the 1970s. Its lifecycle is astounding considering it lives among pools in the mountains of this Spanish island. Oh and the male carries the eggs around his hind legs while they develop! This and other members of the living fossil club are featured in this fascinating documentary short by Rachel Ledbetter. There are stories, urban myths and then there are legends. One such legend is that cats are banned from casinos because they are too good at playing poker. 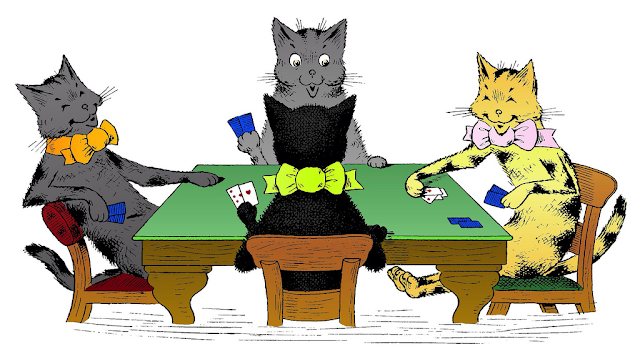 Although this is an entertaining theory you have to remember one thing – cats don’t have opposable thumbs and so playing cards would be difficult, if not impossible, for them. Were cats to choose to gamble it would be better for them to play online casino games at Netbet. Only a gentle pad of the paw is necessary to place a bet online. In truth, casino managers have to be careful and there are some people who, frankly, you would pay to stay away. Take TV and stage illusionist Derren Brown. He has shown his card counting abilities on the TV on a number of occasions so when a casino in Birmingham (UK) got wind that Brown was planning to pay them a visit they promptly informed him that their blackjack tables would be out of bounds to him. There are some people you would think a casino would welcome with open arms. Take the world-famous singing group One Direction. Last year they were staying in a Las Vegas hotel which had a casino attached. What fantastic free publicity! However, after someone did a quick calculation the casino realised that all the members of the group were still under 21 (the legal age for gambling in Nevada). Cue a rush to get the boys out of the casino and in to the fresh air! Of course, sometimes people do have to be quickly and politely removed from even the politest of establishments and that must be a sight to behold for curious onlookers. However, what I would really, really like to see is how the manager of a casino might react if four feline friends did indeed enter the place and make their way, coolly slinking through the lines of slot machines, to the blackjack tables!